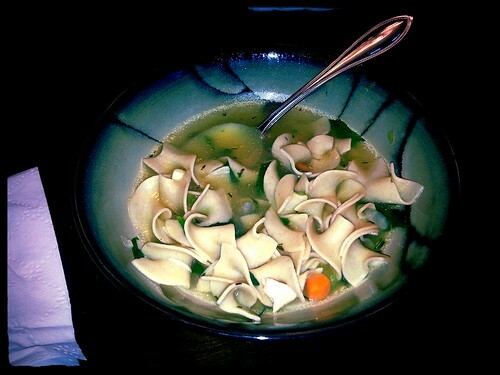 My Chicken Noodle Soup, aka, Mom’s modified turkey noodle soup. There is nothing earth-shattering or extraordinary done here, just happy that the adults were actually feeling much better after having it, along with a combination with such things as antibiotics, rest and hydration. We still credit my Mom’s now-bastardized turkey noodle soup (traditionally, only after Thanksgiving meal), with some alterations she’d slap me over – for never wanting while she was here to enjoy it. A precious few of us still make my Mom’s soup during an illness, rainy weather, or just ‘cuz we miss her (Cancer took her almost 8 years ago. A few are still raw.). Halloween was one of those days. The family we lives with was besieged with strep throat, which was lingering and misery-making. And I’m so rarely hungry (prescription medication) that I have trouble getting nutrients in, so I am having to get creative on jamming nutrition in small amounts without having tons of prepackaged food bars and shakes. I want natural vitamins and minerals from my diet, but that’s hard to do most days. I knew we adults were headed for biological doom while taking care of the sick little ones, so adrenaline and Depeche Mode pushed me through. It turned out tasty with my off-the cuff, empty-the-fridge modifications. -in her defense, she was attempting making one soup that everyone would enjoy. Even the addition of the sour cream was a hidden step until she thought her grandkids could handle it being in their food. I made this hurriedly on Thursday, because with strep in the house, it was all hands on deck and I didn’t know if/when it would hit me. If I’d had more time, I would not have used the rotisserie chicken as the flavor (garlic, from Harris Teeter) was too bold a flavor for this version. I will next time either use the cooked and de-boned rotisserie chicken breast meat (as found at Costco SO cheap) or poach boneless/skinless/fat removed chicken breast in the veggie stock and possibly added chicken stock bouillon chunk or two. I also decided to try enhancing it with take-aways from weeks of watching cooking shows. I boiled veggie stock down a bit, and then added the cooled meat from a rotisserie garlic chicken (was an awful choice, for my palate, compared to simply poached boneless, skinless chicken breasts) and whole wheat egg noodles. Next time, I will cook the broth down more, but also increase the amount at the start if we have cooties. I forgot to calculate the illness-to-broth-requirement. If you have the time, do this step, I am positive it will improve the flavor without smashing your taste buds as this chicken did. Pour 3 boxes of broth into a stockpot. Bring to a slow boil. Add egg noodles and pre-cooked chicken and cook to package instructions. If making a separate batch for more mature palates, go ahead and prepare mirepoix (see below) while the broth is boiling and the egg noodles are cooking. Mirepoix – celery, onion and carrots diced into uniform shape. They are key for the base of most soups, as it gives an aromatic base to all you care to mix in to it. That said, the vegetables are insanely cheap to buy, so I would recommend doing this step yourself if you can make the time, can do the cutting (or have a helpful bestie), don’t mind doing the onions and/or don’t have the option for Organic pre-chopped to make it worth the while. Allow to cool off the heat while the noodles cook. With the kid-friendlier portions of soup (stock, noodles, chicken) removed from the stockpot, I stirred in the still warm mirepoix and let it bubble for a bit, along with two handfuls of baby spinach chiffonade and pre-cooked quinoa (just to use it up) enough to warm it all up to a nice bubbling. Adjust seasoning with the salt and pepper and it was delish and filling. Mom’s original turkey noodle soup recipe ended with sour cream stirred into the soup and dissolved into it, shortly before serving. It gave it a super rich and filling touch. If it was the giant pot, as it was in later years because we all hung around for the late dinner of soup, she used a full pint. I always stirred in about half that (too much fat), and it still rocks. NOTE: I had to add more salt for my palate, but otherwise it was almost exactly like the sour cream version. Still, a little goes a long way. Swap out your protein substitute of choice. Omit the butter and either replace with Earth’s Balance or increase the olive oil; leave out the sour cream/Greek yogurt unless you have a replacement you like. *Add it to a small portion in a separate bowl and see how it breaks down in the boiling hot soup. I’ve seen things, scary things, when you expect a similar reaction for dairy replacements. You don’t want to do all this work and then have it be inedible.